Over the past month both K&K Audio and my family have moved 18 miles northwest to an unincorporated part of Chapel Hill. It’s quieter here and the pace is more relaxed. It’s been a painful physical transition due to the stuff (mostly audio related) I had accumulated over 27 years at the prior address. I have only had my audio listening system up for five days now after nearly 4 weeks. I have been pleasantly surprised that the new listening room, which is only about 5-10% bigger than its predecessor, is more to my sonic taste than the one I’ve used since 1995.
http://www.kandkaudio.com/wp-content/uploads/kandklogo340.jpg 0 0 kevinc http://www.kandkaudio.com/wp-content/uploads/kandklogo340.jpg kevinc2018-08-09 17:18:252018-08-09 17:18:25K&K Audio has moved! 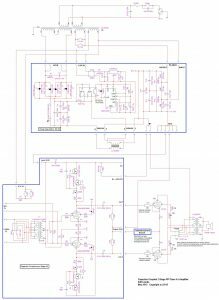 LL2771 – a big (1A, 3H) power supply choke. Would have been great for my PSE6C33C amp power supply…. LL2772 – a low resistance filament current choke (3A, 80mH). Perfect for the Russian GM-70, for example. “Over the years I’ve used Hammond, Electra-Print, Transcendar and Pliton OPT’s. The only one that comes close to the Lundahl is Plitron, and they cost twice as much and take up 3 times the space! You can’t beat the Lundahl’s for the Price!” We agree, Scott! And while you’re at it, look at the chassis artistry, as well! Mir Line Stage is finally available! http://www.kandkaudio.com/wp-content/uploads/kandklogo340.jpg 0 0 kevinc http://www.kandkaudio.com/wp-content/uploads/kandklogo340.jpg kevinc2017-07-29 15:18:562017-07-29 15:18:56Mir Line Stage is finally available! I’ve designed and begun the assembly of a PP KT120/150 monoblock amplifier that uses the new capacitor-coupled 6J49P PP input stage and one of the new power supply kits. The power supply is choke input for low noise and uses a lower cost, over-sized toroidal power transformer. The output stage is operated Class A1 with a common current source in the cathode circuit (on the heat sink at the back of the chassis) and can be switched between triode and “ultralinear” operation. The chassis (20″ x 10″ x 3.2″) is made from Par-Metal Products 10 series sides and backs, with an aluminum top panel (0.09 inches thick) drilled by me and powder coated locally in “satin black”. 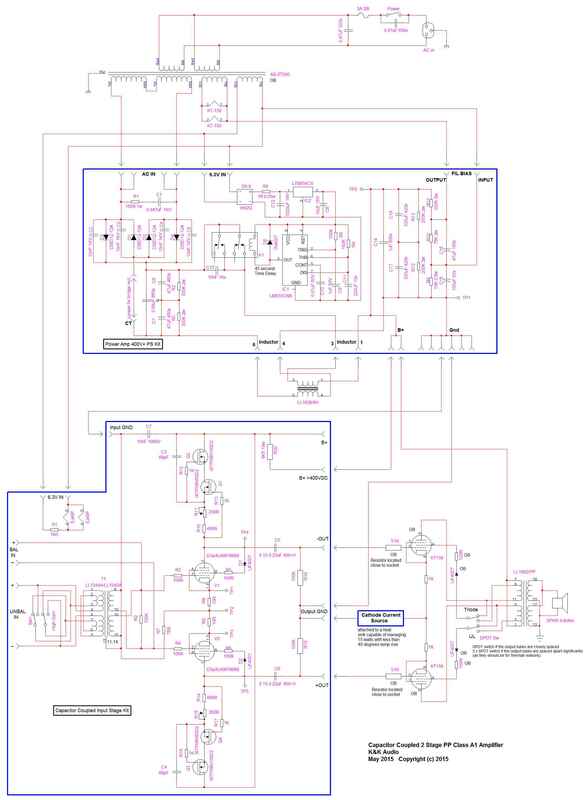 As you can (barely) see in the schematic below, there are relatively few components off of the PC boards, making wiring a straightforward task. I’ll post more info as the build continues.